Rain stops play is all too familiar a saying but we in Scotland are used to the weather and while it may be inconvenient, even soul destroying at times, we have to persevere as there’s nothing else for it. Work continues unless it absolutely neccesary to stop. Fortunately Covanburn Contractors are like minded and they arrived to find their site at Sevenacres flooded this morning after heavy rain brought the Lugton Water into spate again. yesterday the site was dry across most of the work area and contractors awaited delivery of their inflatable offer dam. Today they have the dam but need to wait on water levels to subside. They just needed a more few hours of good weather and their inflatable dam would have been in place. They did try to install it this morning but decide to abandon that and carry on with other works as the levels drop back slowly. They may try again this afternoon. In the meantime, joiners are cutting timber for shuttering and the place is a hive of activity. The key to their plans is to divert water through cores cut in the dam and they set about installing staging this morning to allow a second hole to be cut. 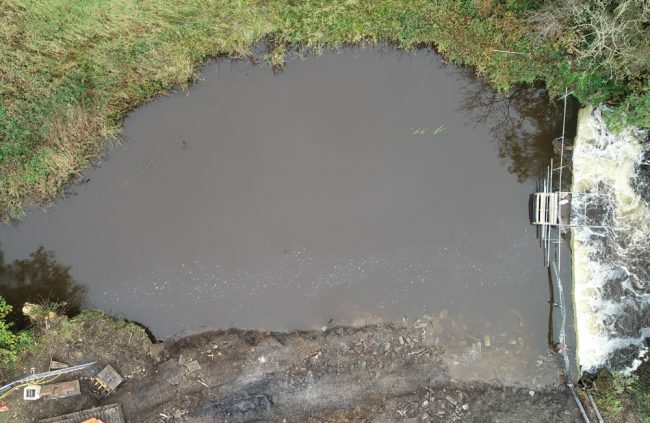 They had hoped a single 600mm diameter hole would be adequate but while that coped with most of the flow, it couldn’t cope with the extra volume after rain so another is required. These holes will be reinstated once the job is complete. Erecting scaffolding from which another core will be cut from the dam to allow greater control of water levels. 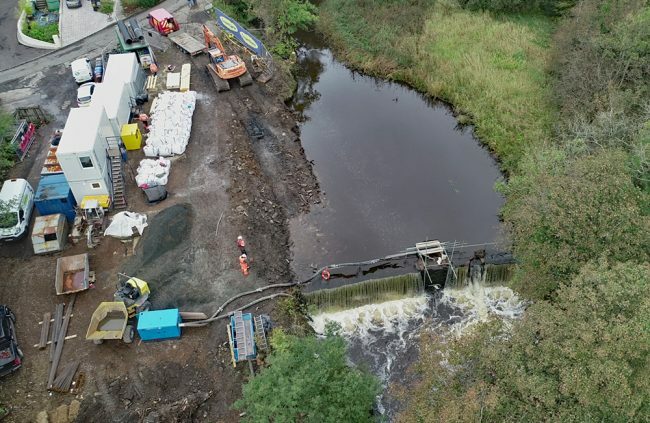 Tomorrow a core cutting team will work from the platform and relieve the pressure on the temporary dam as they open another hole if the old weir. The long reach excavator has been replaced with a 16T LGP machine and this has removed the tree stumps and made an access ramp into the river bed. 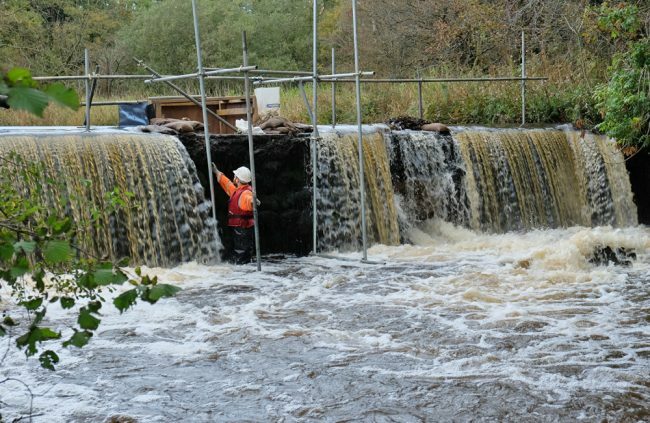 As soon as the water levels drop back the temporary dam will go in and the site will be drained again. 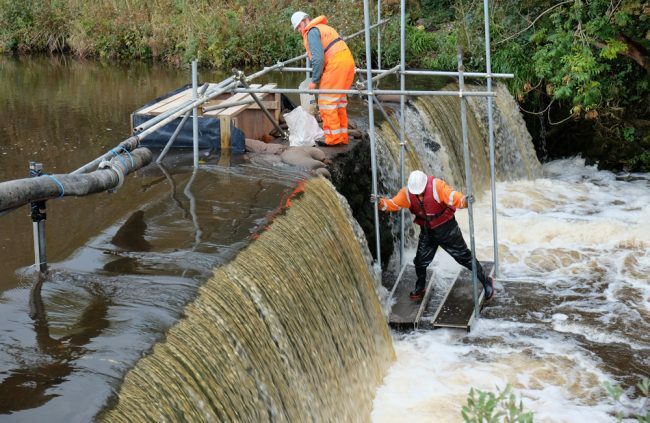 The extra hole in the face of the dam will help relieve pressure against the inflatable dam and this will have sand bags as additional support. Foundations can then be excavated, shuttering installed, steelwork added and concrete poured. Simple really. The site is full of materials and the team are at action stations, just waiting for levels to drop. The plans are in place, the teams are ready, let’s just hope rain doesn’t stop play.